Known for culture and vibrancy it is no surprise that street art is in full bloom across Brighton & Hove. 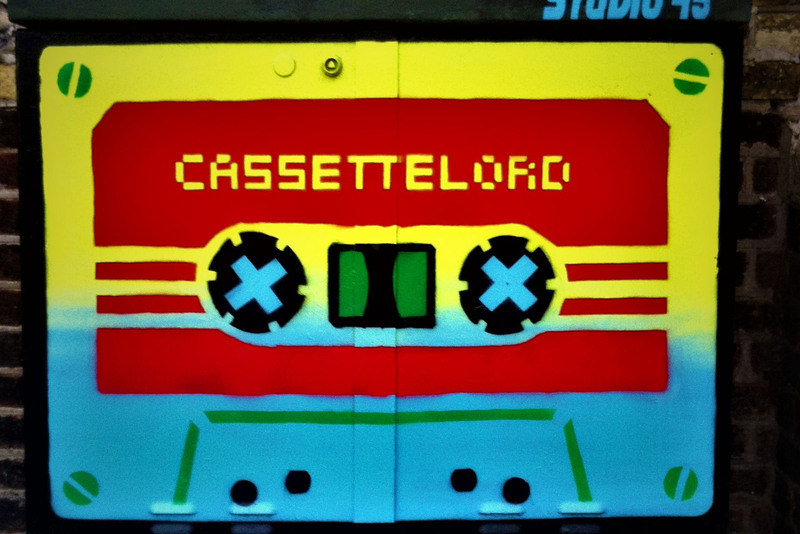 With Cassette Lord’s giant cassette tapes popping up across town and Sinna One contributing to the mesmerising mural on The Prince Albert, this amazing colourful city is home to a multitude of incredible artists. 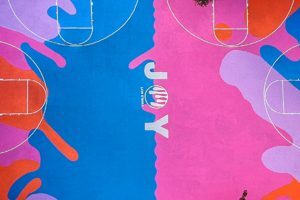 Lois’s love of vibrancy was made evident with Rainbow Crosswalk by the West Pier and by creating the UK’s first basketball art court for Saunders Park. “I really wanted to renovate the deteriorating space so that people could play sport on it once more! I wanted to also bring colour to the court, so it was attractive and unique”. As for right now, Lois is currently working on a project designing a Brighton & Hove bus. 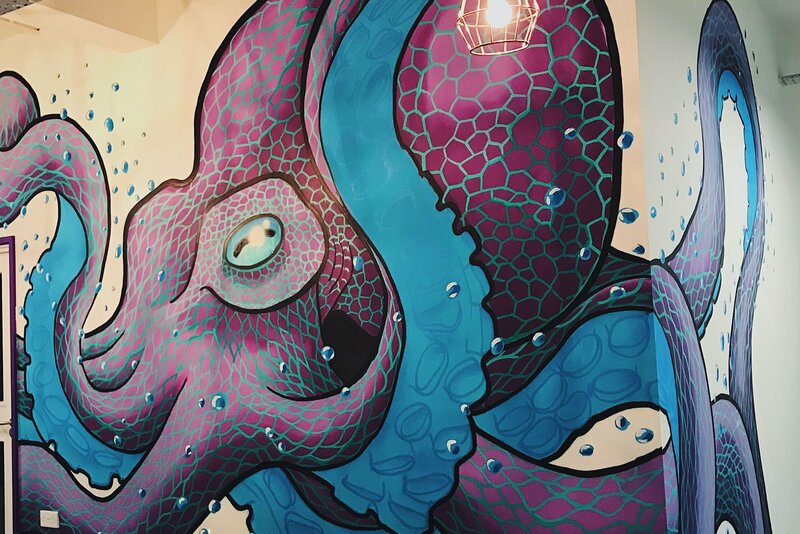 Brighton’s most impressive mural on The Prince Albert pub was painted by Sinna One in collaboration with Req. “It was an amazing experience and it was the first time that I’d ever painted portraits in spray paint. Req mentored me on the project and taught me an amazing technique for scaling an image up from a photo and working freehand. 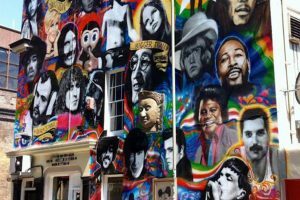 It was hard.” The giant mural depicting 25 dead music icons is a staple piece within the city. It is near impossible to walk around Brighton without spotting the infamous robot created by renowned street artist Snub23. 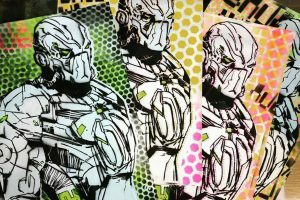 This trademark creation is called ‘Mongrel’ and originates from the comic 2000AD. “He was massive, he hardly said anything, he was aggressive and smashes things up but it’s not through anger, he’s a machine and just does it. He destroys stuff, that’s his nature and that appeals to me”. Snub23 starting painting in the 1990s and has had work featured in exhibitions and painted in events across the globe including Asia and Europe. Mostly importantly he has many works across Brighton in areas such as Kensington Street and Trafalgar Lane. Cover image by Frankie Strand.